America after the 2016 Election: What Comes Next? A new M.A. program in International Migration Studies is starting at the CUNY Graduate Center. It is the first such program on the East Coast. The program’s innovative 30-credit curriculum includes four foundational courses in International Migration, Global Immigrant Cities, Research Methods, and Migration Policy. Students will then choose among a rich array of elective courses offered in varied academic fields. They will complete the program with an individual capstone project under guidance from a faculty member. The program readies students for opportunities in advocacy, policy-making, social services, education, human resources, and labor management; it is also excellent preparation for doctoral study. CUNY has a notable concentration of top migration scholars, giving students both access to academic excellence at a fraction of the cost of other universities and the ability to study international migration in one of the world’s most diverse and global cities. It just doesn’t get more exciting than this! The program is now accepting applications for the fall 2018 semester (deadline: 4/15/18). Contact Prof. Els de Graauw (edegraauw@gc.cuny.edu) for more information. This is a very helpful resource from CUNY School of Law and was updated September 25, 2017. The Undergraduate Student Government at Baruch is hosting a panel discussion on DACA, sanctuary cities, and other immigration-related issues. Called “Keep the Dream Alive” it will take place on Thursday, Sept. 28, from 6 to 8 PM, in the Multipurpose Room. More information is available on the event’s Facebook page. As you are no doubt aware, yesterday President Trump ordered an end to the Obama-era Deferred Action for Childhood Arrivals (DACA) program, which has shielded from deportation more than 800,000 people, including the “Dreamers”—young undocumented immigrants who were brought to the United States as children. The president called on Congress to act within six months on legislation to replace the policy before it fully expires on March 5, 2018. As a result of the president’s decision yesterday, the government will no longer accept new applications from undocumented immigrants for the DACA program. However, current beneficiaries will not be immediately affected, as the Administration has indicated its intention to have an “orderly wind down” of the program. At the same time, some individuals covered under DACA will be able to renew their two-year period of legal status through Thursday, October 5. I therefore urge anyone at Baruch for whom this renewal option may be applicable to act immediately to take advantage of this additional period of legality. Baruch’s campus is and always has been deeply enriched by the extraordinary diversity of our students, faculty, and staff. We not only seek but also welcome and greatly value the intellectual, cultural, and academic contributions of people from all national backgrounds, and we do not ask about an applicant’s immigration status when making our admissions decisions nor while a student is enrolled at the College. We understand full well that this unwarranted, unnecessary, and heartless decision may cause many DACA beneficiaries, and their families, to suffer great anxiety, uncertainty, and emotional upset. I want to assure you that, as indicated in Chancellor Milliken’s statement yesterday, The City University of New York (CUNY) is committed to doing everything possible within our legal authority to protect DACA students, faculty, and staff. In this regard, we will not cooperate with or agree to a request by Immigration and Customs Enforcement (ICE) to come on the Baruch campus, unless such a request is made in conjunction with a bona fide search warrant issued by the courts.
? The Baruch College Counseling Center offers students individual and group counseling.
? The Employee Assistance Program, administered through Deer Oaks, is available to faculty and staff.
? CUNY Citizenship Now is a strong resource for questions surrounding immigration status or services. In addition, I hereby request that no one on the campus respond to any inquiry regarding the immigration status of a specific student, faculty, or staff member. Rather, please direct all such questions to the College’s Office of the Executive Legal Counsel. Yesterday evening, I joined Mayor Bill de Blasio, Council Speaker Melissa Mark-Viverito (MPA ’95), Cardinal Timothy Dolan, the Reverend Al Sharpton, and dozens of other leaders from the higher education, religious, not-for-profit, and business communities at a press conference on the steps of City Hall. We gathered to demonstrate our firm and full commitment to, and support for, Dreamers and all immigrants who collectively represent the heart and soul of the great melting pot that is New York City. Since the founding of the Free Academy in 1847, on the site of what is now Baruch’s Lawrence and Eris Field Building at 17 Lexington Avenue, educating immigrants and the children of immigrants has been central to Baruch’s mission and to that of CUNY. The College remains fully committed to doing everything within its power to support and protect our students, faculty, and staff, regardless of their immigration status. Lillie and Nathan Ackerman Lecture, which welcomes Roberto G. Gonzales, PhD, of the ​Harvard University Graduate School of Education. This event is on Monday, May 8, at 5:30 pm, Simon Conference Room, NVC 14-220. Thursday, May 11, 2017, 10am-6pm | CUNY Murphy Institute, 25 W. 43 St., 18th Fl. This all-day conference will assess the unfolding immigration crisis, highlighting the perspectives of labor unions, worker centers, community organizations, and local government. The Trump administration’s efforts to restrict immigration, expand deportations, thwart sanctuary cities, and intensify border enforcement mark dramatic shifts in immigration politics and policies. This event convenes a range of national and local experts and leaders to explore the implications of these national shifts, especially for local immigrant communities and the possibilities for resistance. The conference will be held on Thursday, May 11th from 10am-6pm at the CUNY Murphy Institute for Labor Studies, in midtown Manhattan. It is co-sponsored by the Murphy Institute and the New York City chapter of the Scholars Strategy Network. 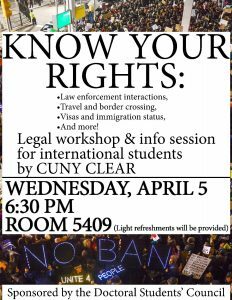 Immigrant rights workshop: Know your rights! An ICE agent has attempted to get information about a City College student. Please remember that under CUNY policy, staff or faculty member may NOT disclose information — even directory information — about current or former students to federal immigration authorities, except in response to a lawfully issued subpoena. current book project, Refuge in Post Cold War America, is a study of U.S. refugee policy in the Post-Cold War and post 9/11 era, which will be out later this year. Shane Kadidal is senior managing attorney at the Center for Constitutional Rights. He will assess the constitutionality of the EOs and also present on Know Your Rights. Mr. Kadidal has worked on several significant cases arising in the wake of 9/11, including the Center’s challenges to the indefinite detention of men at Guantánamo and domestic immigration sweeps. He has been counsel in major CCR cases, including Holder v. Humanitarian Law Project, United States of America and Vulcan Society, Inc. v. City of New York, and legal challenges to the NSA’s warrantless surveillance program. Along with others at the Center for Constitutional Rights, he currently serves as U.S. counsel to WikiLeaks publisher Julian Assange in connection with potential Espionage Act charges, extradition, and the funding embargo.